Data Hub goal is to unify different data silos; interesting for data warehousing as it already consolidating data. How does the Data Hub relate to BW/4HANA? Hello – If someone intent to use On-premise BW/4 and S/4 HANA in Scale-up deployment, what are the options for using Warm data in BW/4 using Extension nodes? Assuming it sits in Haddop – BW/4 includes a Hadoop connector this is also something that the SAP Data Hub solution could help orchestrate and bring data to BW4 as necessary. We are on SAP BW on HANA 7.4 – Including the time to upgrade to 7.5 %2B In Place Conversion, does that equal to a 3 months project ? Could you elaborate on the Remote conversion of BW on any DB to BW4HANA? Why has the ‘Planning’ option for aDSO disappeared in the BW modeling tools? Is it covered by BPC/4HANA now? We have an existing investment in a HANA sidecar scenario building out our models with a native SQL based approach. How would I justify an additional investment in BW4HANA. We know we can leverage the same HANA views through BW4HANA but that does not justify an investment in BW4HANA. Other arguments are typically around modelling and master data. But are there any other selling factors? typically matters of scale: cross functional reporting, scheduling, error handling begin to play a role. BW4 has an entire infrastructure to manage 100s or 1000s of data flows. doing it in HANA native requires custom dev or 3rd party solutions. BW4 provides a packaged offering. there’s also Business Content as mentioned. Finally there are dozens of “small things” like integrated Currency and UOM handling, data handling for xTD reporting etc … the OLAP Processor in BW remains a powerful solution on top of SAP HAnA. #asksap We are planning to migrate to SAP BW/4 HANA, Could you please help, with the approximate installation and maintenance cost .. and also we will not migrate everything into HANA and will plan future projects to be developed in HANA, in that case how to plan every Infocube out of BWA? Some experience integrating SAP BW/4 HANA with Hortonworks HDP platform? Please check out our Data Hub solution which Marc Hartz will give a brief presentation at the end here. Much more information from SAP Teched if you have access. Please check with your SAP sales rep if you need more in-depth, 1:1 information/discussion. We are planning to migrate to SAP BW/4 HANA, Could you please help, with the approximate installation and maintenance cost .. and also we will not migrate everything into HANA and will plan future projects to be developed in HANA, in that case how to plan every Infocube out of BWA? Archiving to NLS Sybase IQ vs. Using Hadoop for Archiving – Cost; History Reporting if needed; Reduce data HANA DB etc..Which is more advantage based on SAP future strategies? We let customers leverage the environment appropriate to their design objectives. Sybase IQ is a very powerful, disk-based columnar solution which still holds the World DW scale record at 12.1PB. That means when we have IoT directly coming into BW/4Hana, so we can perform predictive analysis in BW/4Hana and create work orders in ERP for maintenance … Is it possible? SAP has solutions to help with the middleware required to get to this state. our Predictive Maintenance solution addresses this end to end. BW/4HANA would certainly be part of the solution for reporting and analytics off of the IoT scenario. SAP-BODS can be directly connected with BW4HANA to get data in aDSO ? 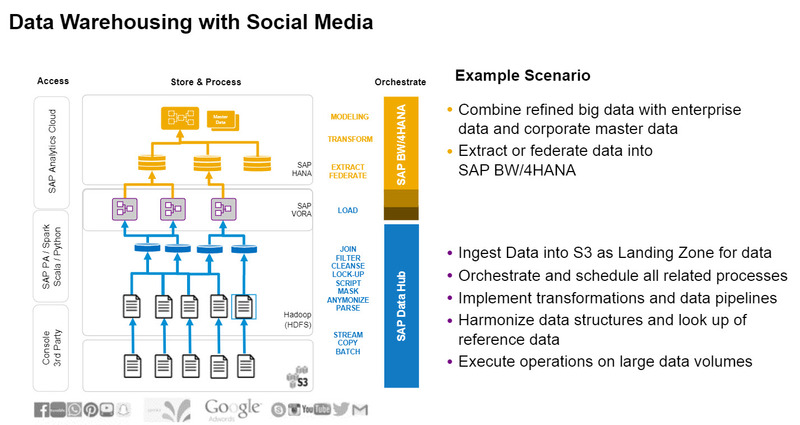 Twitter: is DataWarehouse still needed for 80 % of Analytics need that are operationnal, Real Time, Direct access to data? How will BW/4HANA help customers migrate their current BW system with complex ABAP business logic ? to the extent that those are reports, BW4 could be used to address those requirements functioning as a data warehouse. ok. but we don’t want to introduce another tool like data hub/vora and want to use standard connectors. 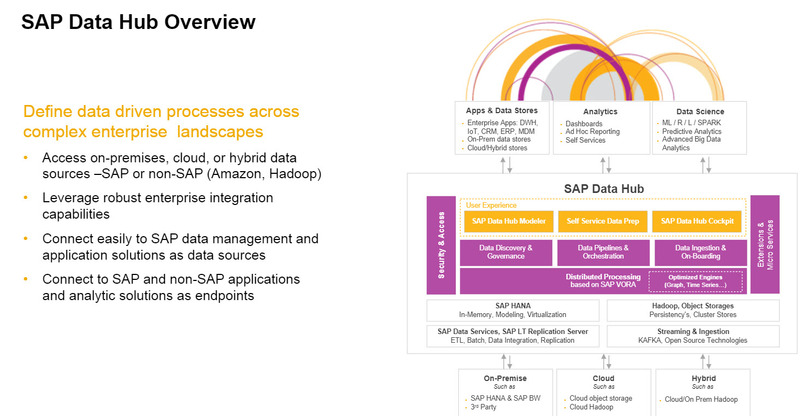 Will SDI be able to pull data from SAP IQ/HADOOP at run time for reporting? Performance will not be a big concern and will not be part of SLA. the SAP Data Hub section will be important to hear. Is there an Major update expected to BO to keep up with all the new features on BW4/Hana and the other competitors? BO 4.2 SP04 supports BW4. SAP SLT would be an ideal solution. What’s the role for the new Web IDE in a BW/4HANA scenario? What is the recommended extraction process from S/4 HANA to B/4HANA? Standard extractors work. Customers are free to use CDS Views via ODP to send data to BW4. the delivered business content continues to reflect the ECC6 data model and thus the extractors provide the best integration currently. Will SAP Data Hub be available as a Trial or Developer edition in the SAP Cloud Appliance Library so customers can try it without an on-premise setup? BW/4 HANA is presented as better at integrating external source data. Why would Data Hub and Vora be necessary then? 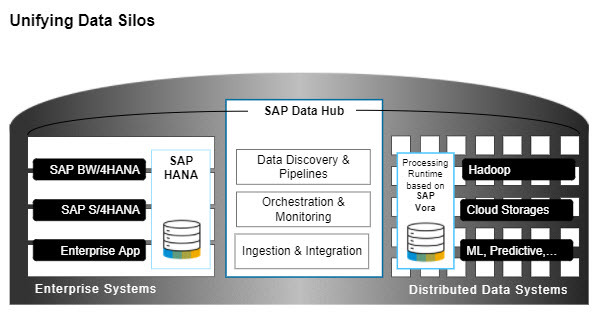 Vora provides highly optimized Spark integration (extensions written by SAP on open source). Data Hub provides a solution for end to end data movement and monitoring at scale… that’s the trick when you approach 100s or 1000s of data movements across big data, things get extremely difficult to manage. A lot of confirmation from largescale customers who face this now that Hadoop/big data is in production. Can we say that BW4/Hana is on-Premise SAP leonardo? BW4 and Leonardo would work in concert with one another. Why is a ‘Data Swamp’ part of the Data Hub architecture diagram? a poorly managed data lake becomes a swamp. BW/4 HANA Support Direct access mode of BW Data source which do not required to persist data into BW? (ex: 0FIGL_M30 0FIGL_M20 0FIAA_M20 for each module there are direct access supported using datasource like 0fi_gl_12 0FI_ACDOCA_20 etc..) ? Will HANA 2 NDSO be integrated with BW/4HANA? How will BW/4HANA benefit customers in migrating current business logic written in ABAP ? Are there any conversion or migration tools available ? this is under evaluation as part of the tools which provide insight into housekeeping activities on BW4. After migrating to SAPBW/4HANA, what is the best practice to take the Infocubes out of BWA and runs in HANA platform? Conversion tools convert Infocubes to ADSOs. at that point the entire database for HANA is in-memory. (migration ot HANA is part of BW4 conversion). Remote migration is your option to look at it. Which are the main advantages of ODP data sources? Can we convert Infocube to ADSO with Data? What’s going to replace the Enterprise Portal? SCP Portal, Lumira Designer, or a custom Fiori app? EP continues. SCP is a tool of choice for some customers. There’s also the Analytics Hub solution. is there a benefit to move to BW4/HANA before going to S/4HANA? would there be a lot of changes to be done? absolutely. this would give you a chance to check out managing an enterprise application on HANA as well as having benefit of the BW4 features we mentioned. What role does BW play in terms of a logical data warehouse environment? Is the BW the logical data warehouse? it has potential to play that role, yes. please see the DW whitepaper linked at the end of this presentation and see BW4 on our web site. Why is Katerra using BW instead of HANA Native EDW? 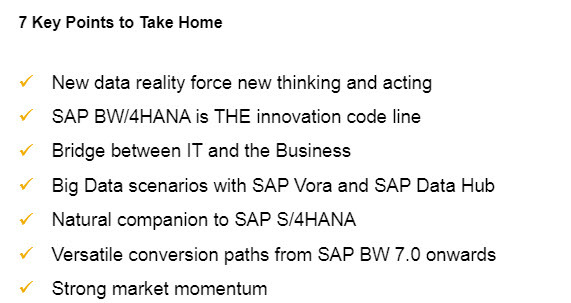 As majority of our data sources is from S/4HANA, it is advisable to use BW/4HANA..Also now with BW/4HANA it is more simplified now to get Non SAP data to BW with SDA/SDI and Open DSO’s. There is sap note talks about white listed datasources which talks about allowed datasources indicate few of datasources are not supported by BW4HANA ? Any lights on that ? yes. this list has to be considered when moving to ODP. Feedback from customers is that most of the newer extractors delivered in the last 3 – 5 years cover those older extractors which have been deprecated. B/4 to On Premise SAP Portal NW 7.5 AND B/4 to Cloud SAP Portal both supported? as like BW to On premise SAP Portal ? The integration point is now SAP BusinessObjects so please check roadmaps for Portal-BO options going forward. As part of UI Harmonization, B/4 Reporting and Various tools can be integrate / sso / accessed from Single Source of UI ex: Embedded Fiori Lauchpad of Portal (i.e. FLP @ EP in On premise portal) where we are merging all FIori APP, Classical Transactional tile, etc..? depends on the frontend solution selected. BusinessObjects 4.2 SP04 introduced direct Fiori presentation for specific components. see the roadmap for BO solutions. after year 2025 SAP will support only installation on Hana or continue to support other databases ( eg sql , oracle , etc ) ? No. please see SAP Notes relevant to your SAP solution for direct steps. Recently we went live with 7.5 BW on HANA in June 2017 and now SAP suggesting to move to SAP B/4 HANA. How good with these very frequent SAP product suite changes for customers to adapt after investing a lot on earlier versions. BW 7.5 is supported until end of 2022. Customers wanting to innovate sooner can move immediately to BW4. All new development is now in BW4. BW 7.5 is in maintenance mode as far as features but bug fixes will be given untl 2022. Is SLT obsolete due to well working streaming based on ODP on BW/4? no. ODP is an application level data exchange. SLT provides database level replication for specific platforms. What are the scenarios that you chose to persist the data? typically: virtualize for agility (prototyping, testing, concept development) persist for performance (since you’re working on an in-memory platform. for realtime extraction where required, you said that the ODP interface supports ABAP CDS Views. so what about standard BW extractor like 0FI_ACDOCA_20/10 0FI_GL_12 – are they required any ODP ? I understand that one can consume native SAP hana views in bw/4hana – but do they also support delta capabilities ?